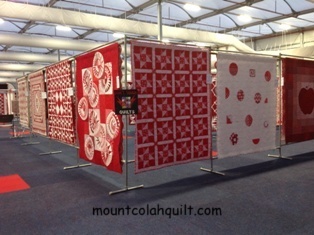 I left Australia for France on the first day of this year Sydney Quilt Show, so missed out on seeing my own quilt hung at the Show. This is the second time that I missed the opportunity since I started entering my quilt to the Sydney Quilt Show in 2011. It won't be the last time, so I have to get used to the idea of me not always being around locally while the Show is on.! My drop-off lady, Kaye Graham, and my SYD-SCQuilter fellow, Marianne Roberts, kindly took a few photos of my 'Winter Star Quilt' while it was on display at the Show. I am very grateful for the photos taken by both Kaye and Marianne. 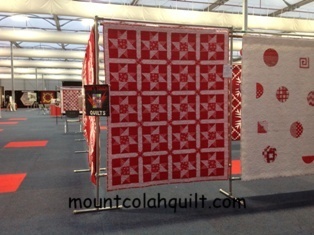 The Quilters' Guild of NSW has 'Red and White Online Gallery' in its August 2015 e-Newsletter. 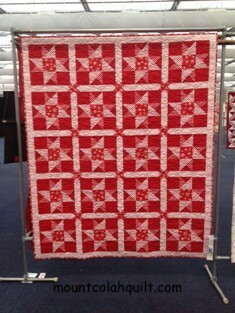 My 'Winter Star Quilt' is on page 5.